dinner, auction, inflatables, music, entertainment, crafts, food vendors –and much more! Doors open at 5 p.m., and take out dinners can be picked up inside the Parish Life Center. Dinner prices are $10 for adults, $6 for senior citizens and children 5-12yrs, and free for 4yrs and under. 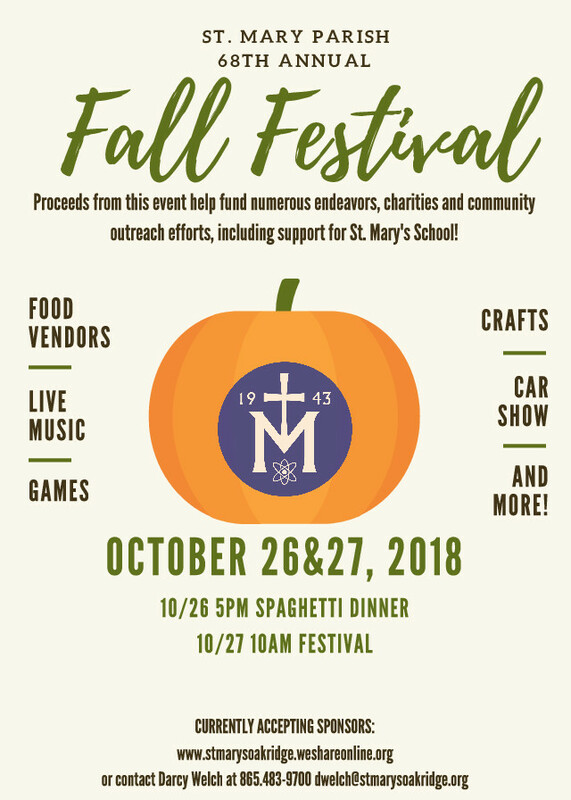 On Saturday, October 27th, the festivities begin at 10 a.m. and continue until 5 p.m. on parish grounds. a Spanish Food Booth. Live music and surprise crowd entertainers will add to the festivities. Live entertainment will be on the main stage throughout the day. Back by popular demand the festival will present the 3rd Annual Fast & Classy Car Club Show from 10am-2pm on the Oak Ridge Turnpike Side of the festival grounds. 9130 or lennaaird@gmail.com. To be a Vendor contact Amy Shoenthaler at Kuntrymomma05@aol.com.